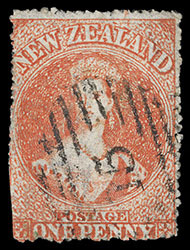 New Zealand, 1862, Queen Victoria "Chalon Head", 1d orange vermilion, serrated perf 16/18, Large Star watermark, serrates nearly all around, strong vibrant color, neatly cancelled by numeral "15" barred oval of Nelson, Very Fine and rare, Joseph Hackmey, Spink Shreves, February 2009, lot 1227. Scott No. 11b. Campbell Paterson No. A1e (T). SG No. 59 £2,250 ($2,960). 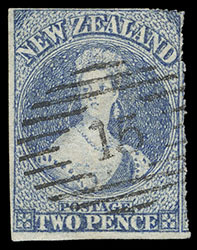 A CHOICE EXAMPLE OF THIS EXCEEDINGLY DIFFICULT AND RARE STAMP. The postmaster at Nelson used several experimental wheels to separate stamps, the commonest being the serrate 18. Most examples known are cancelled with the numeral "15" barred oval. A few are cancelled at local post offices, Richmond and Motueka. 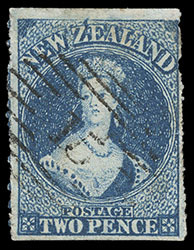 New Zealand, 1862, Queen Victoria "Chalon Head", 2d deep blue, serrated perf 16/18, plate flaw, Large Star watermark, Colored spot above "Z" (R.9/9), serrates showing at sides, rich color on bright paper, neat strike of numeral "15" barred oval of Nelson, Very Fine and choice example of this scarce stamp, Adam Hunter (Lot 1161, 7/16/1980); with 1971 R.P.S.L. certificate. Scott No. 12b var. Campbell Paterson No. A2d (W). SG No. 60 var. £1,300 ($1,710). 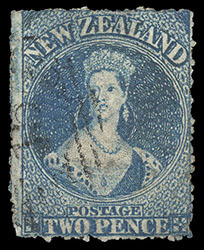 New Zealand, 1862, Queen Victoria "Chalon Head", 2d blue, serrated perf 16/18, Large Star watermark, serrated mostly all around, lightly cancelled by numeral "15" barred oval of Nelson, F.-V.F. and scarce, Major Henry Dumas, Spink, March 2000, lot 127; with 1952 B.P.A. (Deep Blue shade) certificate. Scott No. 12b var. Campbell Paterson No. A2d (W) var. 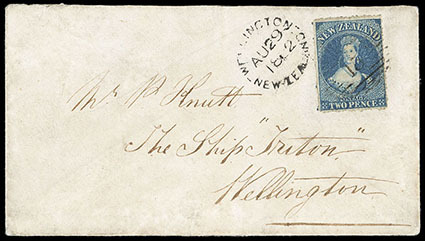 New Zealand, 1862, Queen Victoria "Chalon Head", 2d deep blue, serrated perf 16/18, Large Star watermark, serrates mostly all around, neatly tied by numeral "15" barred oval on cover addressed to "The Ship 'Triton' " at Wellington, a Very Fine and attractive use, Yeroc, J.M.A. Gregson, January 2000, lot 323; with 1989 B.P.A. certificate. Scott No. 12b. Campbell Paterson No. A2d (W). SG No. 60 Estimate $3,000 - 4,000. THE 1862 2D DEEP BLUE WITH NELSON 16-18 SERRATES IS A GREAT RARITY ON COVER. New Zealand, 1862, Queen Victoria "Chalon Head", 2d slate blue, serrated perf 16/18, Large Star watermark, serrates at right and top corner, beautiful strong color and impression, sharp numeral "15" barred oval of Nelson, fresh and Very Fine. Scott No. 12b var. Campbell Paterson No. A2d (K). SG No. 61 Estimate $750 - 1,000. AN EXCEPTIONALLY RARE STAMP, LISTED BUT UNPRICED IN BOTH STANLEY GIBBONS AND CAMPBELL-PATERSON. 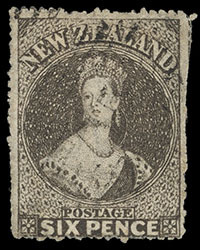 New Zealand, 1862, Queen Victoria "Chalon Head", 6d black brown, serrated perf 16/18, Large Star watermark, serrates mostly all around with wide margins, rich color, lightly cancelled by numeral "15" barred ovals of Nelson, Very Fine and rare; with 1938 R.P.S.L. certificate. Scott No. 14b. Campbell Paterson No. A5b (T). SG No. 63 £1,800 ($2,360). A CHOICE SOUND EXAMPLE OF THE 1862 6D BLACK BROWN SERRATED 16-18 AT NELSON. 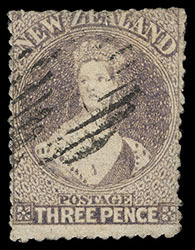 New Zealand, 1862, Queen Victoria "Chalon Head", 3d brown lilac, serrate perf 13, Large Star watermark, cancelled by two partial strikes of barred oval, serrations all around, deep color, small repair at upper right corner, Very Fine appearing example of this rare stamp, Joseph Hackmey, Spink Shreves, May 2010, lot 2237; signed W Houtzamer, with 1948 & 2001 R.P.S.L. certificates. Scott No. 13 var. Campbell Paterson No. A3a (X). SG No. 67u £1,800 ($2,360).